...so I need to give one away! That's right, this is one of our best giveaways yet, a true handcrafted masterpiece made in the USA by a wonderful couple who take pride in their work. To top off the excellent quality of these handcrafted frames by Frame-Love is the use of organic milk paint which is a more organic natural paint that is better for the artisan and for your family! I purchased one of these frames so that I could see what the quality was, hey, I am a skeptic by nature! I got a 5x7 Green Tea picture frame under the Feeling Groovy section! I LOVE it, it is just as beautiful as it looks on the site! Visit Frame-Love and take a look at the great selection of frames that they offer! And don't be afraid to ask for something special, I bet you will be amazed at the great service you receive, something that is hard to find these days! 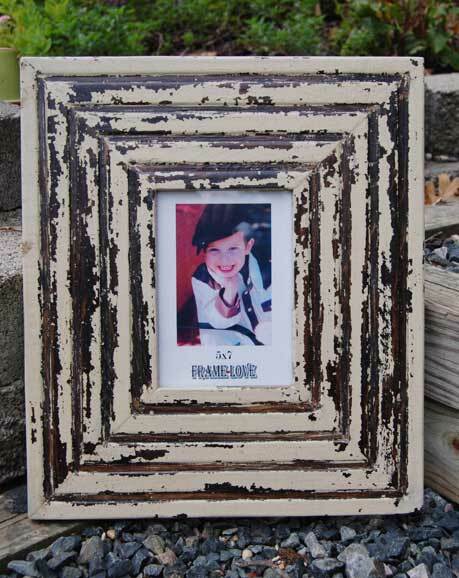 Frame-Love has generously offered to sponsor a giveaway for us and will be offering this stunning bead-board frame! This cream colored distressed frame holds a 5" x 7" image and has a frame width of approximately 4.5" creating a dramatic look. Part frame, part art this frame will looking magnificent on any wall in your home! Frame retails for almost $80! Come back to our blog and let us know which frame is your favorite! Think this is a great contest, then please Stumble, Digg or somehow socialize this post!!! Winner will be chosen at random. All additional entries for subscriptions and button placements will be verified. Winner will be announced on our blog in this post and via email on October 27, 2008! Winner has 5 days to claim their prize or it will be forfeited to a new winner.